Learn the basics of pruning stone fruit trees in the third year as Felix from Gurney's goes to work on a three year old peach, demonstrating how to balance out the tree for future fruiting. Hi everyone, Felix here at Gurney's and this is our third year, stone fruit, pruning demonstration and we're just going to cover the basics. This is after we've taken each of those steps. 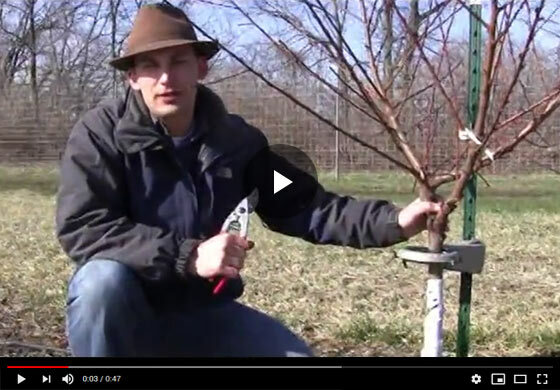 If you look at our video covering planting year, the year and after planting pruning care - and this is our third year - this is really the exciting year because we can get some nice fruit this year. We have a good framework established, a little pruning this year to help open it up as usual, but you can see what the results are from proper pruning of your stone fruits. You can see here's our nice trunk that grew and we had topped it that first year of planting and then we had our scaffold initiation here, nice three branches or four branches that have initiated after that pruning that grew that second year. Actually, this initiated the first years excuse me, but we left them in place the second year and now they've become more woody. You can see the calipers better, then we have a whole slew of initiations that came off of those the last season. So this has had three years of growing. First, you had planting, second-year initiation of these primary scaffolds and then the third year it sent a lot of growth out and we're going to deal with some of that internal growth, it's growing into the middle of the tree with this pruning technique. So we're up here on the top of the tree, where you can see that last season's growth has your flower buds on it. If you've had a nice mild winter, like we have here in zone 5, these buds are nice and green. You can see the green tissue there. If they were dead. If you had a hard winter, they would just be brown, they wouldn't be vibrant anymore, and that's what you look for here in early spring is making sure those flower buds which are those buds that are on the side, they're actually three buds here on this peach and the two ones on two buds on the side are where you get your flower initiation and that's where your fruit development will happen, so always keep in mind on your stone fruits that you get fruit development on last year's growth and you can notice these buds on last year's growth, and that's where you're going to have fruiting. So for pruning purposes, we're going to just take off those branches that don't allow good fruit development in those branches are the ones that are growing downward that are going to be shaded and not get good sun and sun is what develops your sugar and your good food quality and then the interior of the tree there are shoots that develop that just basically allow moisture to hang out, and that is a cross-promotion of disease, you want to have good airflow in the center of your tree. So those are your primary pruning objectives. Course if there is any dead tissue, limbs that have died back you're going to get those out as well. So that's what we're dealing with here. There's a dead shoot that we're taking out, and then a number of these here in the middle that have initiated and just causing density on the interior of the tree. So we're going to thin those out and then any downward growing shoots that are just going to be shaded. Here's one where we have a primary branch coming off into a good direction. We have this lower growing shoot, you know the fruit load is going to come down and be hanging too low for us, so I'm going to flush cut that. The beauty here is that this branch on top is, this doesn't cause a weakness if we are taking the top branch out that causes a weakness here in this angle so that's a consideration when pruning as well, is that it's going to maybe break later, because you're making it weak by an improper cut there. So we have a few other low under growing branches here. So we've taken a portion of the mound out, we still have a number of nice food buds. We still have our three primary scaffolds, we're going to let this crop this year, have a nice fruit load on it, enjoy that and then, for that fourth year pruning, we'll have to cut back some of the vigorous growth to keep the tree down and we'll show that to you in our next video on pruning stone fruits or peaches in this case. Thanks for joining us here at Gurney's.